Earned on purchases EVERYWHERE ELSE! When you redeem points for statement credits toward eligible priceline.com or travel purchases of $25 or more made in the last 120 days. Designed to make paying for your purchases more secure at chip-card terminals in the U.S. and abroad. Provides reimbursement if you see a printed advertisement for the same item (manufacturer and model number) for a lower price within 120 days from the date you purchased the eligible item. Offers Extended Warranty Protection which doubles the time period of the original manufacturer's written U.S. repair warranty up to 1 full year on warranties of 3 years or less when you purchase an eligible item entirely with your eligible Visa card. Lets you keep an eye on your credit score and get alerts when we learn that your score has changed. 1Offer subject to credit approval. Benefits will vary depending upon the card for which you are approved. Not everyone will qualify for the Priceline Signature Visa Card. If at the time of your application you do not meet the credit criteria previously established for this offer, or the income you report is insufficient based on your obligations, we may not be able to open an account for you or you may receive a Visa Platinum card. Please review the materials provided with the Cardmember Agreement you will receive after account opening for more information about the benefits that will apply. This offer is available to new cardmembers only. For information about rates, fees, the Annual Fee, other costs, and the reward program rules (including accrual rate, bonus awards, etc.) and benefits associated with the use of this credit card program please see the Terms and Conditions. 2Please review the Reward Summary for important information about the program benefits and features listed above and the Terms and Conditions for full details about the reward benefits (such as how points are earned), interest rates and account fees and terms for this particular offer before applying. Bonus Points: Five thousand bonus points (5,000) will be awarded at the close of the first billing statement in which you make your first purchase or balance transfer. 5,000 bonus points can be redeemed for statement credits totalling $50 toward purchases of $25 or more that posted in the last 120 days. First use bonus points are limited to new card holders only. A balance transfer is subject to the balance transfer fee set forth in the Terms and Conditions. Earning Points: Cardmember(s) earn "Points" in the following amounts based upon the types of purchase transactions charged to the Account: a) Earn five (5) points for every dollar spent on all eligible purchases made at priceline.com®. Eligible purchases include: cruises (as defined by merchant category code), Name Your Own Price®, Express DealsTM and Pay Now bookings, as well as purchases of Trip Protection products, made on priceline.com. A Pay Now booking is any booking that requires payment at the time of booking and Priceline.com is the merchant of record. For more information on Name Your Own Price and Express Deals, and Trip Protection, please see priceline.com. b) Earn one (1) point for every dollar spent on all other purchases. The following transactions are excluded from "Purchases" and do not earn unless stated: interest, finance charges, balance transfers, convenience checks, cash advances and other fees. Restrictions apply. Please see the Terms and Conditions for more information. Point Redemption: You may redeem your points for a statement credit for any purchase(s) on your Account statement that are $25 or greater and posted within the last 120 days. You earn 10% of your points back as a redemption bonus to use toward your next redemption every time you redeem for statement credits against eligible priceline.com purchases and eligible travel-related purchases. Eligible travel-related purchases are determined by the merchant category code and include: Airlines, Hotels, Motels, Timeshares, Campgrounds, Car Rental Agencies, Cruise Lines, Travel Agencies, Tourist Attractions, Discount Travel Sites, Trains, Buses, Taxis, Limousines, and Ferries. For example, if you redeem 25,000 points for an eligible priceline.com purchase, you will receive 2,500 points as a bonus to use towards your next redemption. Travel redemption bonus points are added to your account within one business day after your travel redemption is processed. FICO® Credit Score Access: FICO is a registered trademark of Fair Isaac Corporation in the United States and other countries. Barclays offers FICO® Credit Score access at its sole discretion. Not all accounts will have FICO® Credit Score available. FICO® Credit Score access is not a permanent feature of your account and may be removed at any time. To view your FICO® Credit Score, your account with us must be open, active (having activity within the past 150 days) and in good standing. 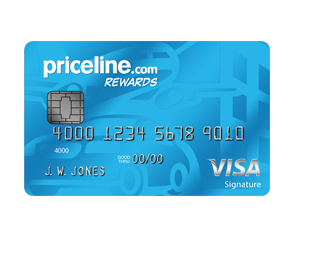 The Priceline RewardsTM Visa Card is issued by Barclays Bank Delaware (Barclays) pursuant to a license by Visa USA Incorporated. Visa is a registered trademark of Visa USA Incorporated.